Lesser snow geese breed along Queen Maud Gulf, Baffin Island, Banks Island and Victoria Island; in the Northwest Territories and on Hudson Bay. They nest on low, grassy tundra plains and broad, shallow rivers near the coast, and on islands within shallow inland lakes. 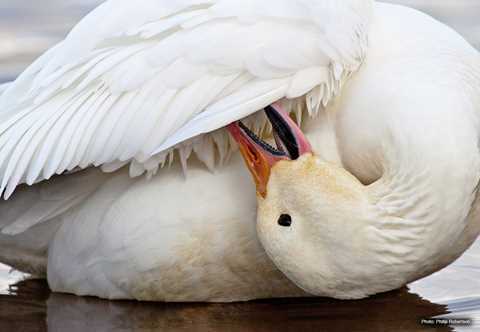 Lesser snow geese nest in colonies and lay an average of 4-5 eggs. Average length: M 29", F 28"
Lesser snow geese have two color phases: a dark (blue) plumage and a white (snow) plumage. The two color phases are variations within the same race and do not indicate separate races. The sexes are similar in appearance in both phases, but the female is often smaller. Lesser snow geese can hybridize with Ross' geese, which are similar in appearance. They have pinkish bills with black grinning patches, and the feet and legs are reddish-pink. In the dark phase they have white heads and upper necks, with bluish-gray bodies. In the white phase they are completely white except for black wing tips. The head can be stained rusty brown from minerals in the soil where they feed. They are very vocal and can often be heard from more than a mile away. 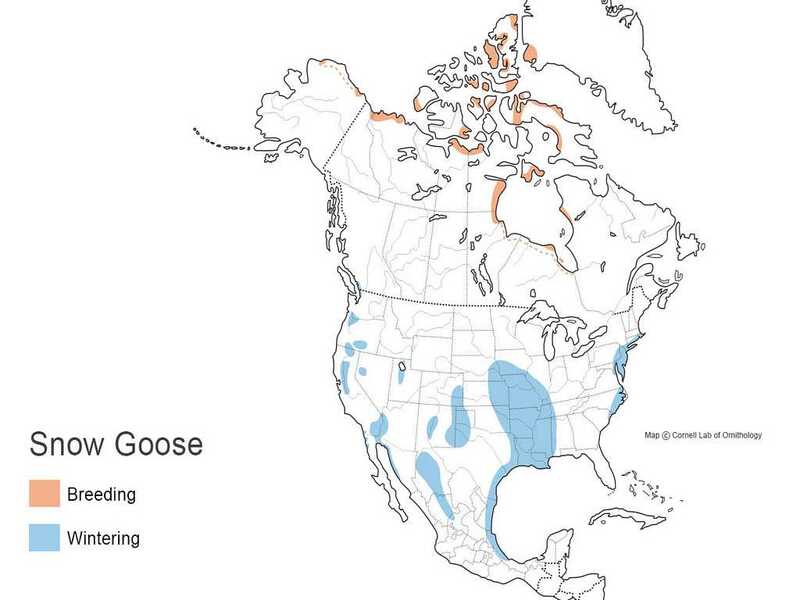 Lesser snow goose distribution is much more diverse than that of the greater snow goose. The lesser snow geese breeding range stretches from the Arctic to high Arctic Islands. While there are pockets of wintering habitats on the mid-Atlantic Coast and the Pacific Coast, the densest wintering locations are in the southern Mississippi Flyway, northwestern Gulf Coast and northcentral Mexico. 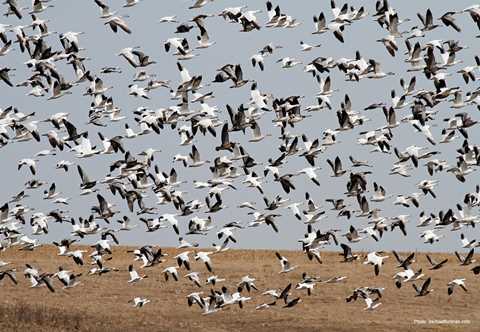 Lesser snow geese historically migrate from their northern breeding grounds down the Pacific and Mississippi Flyways, to winter in the Central Valley of California and the Gulf Coast of Texas, Louisiana, and Mexico. There, the abundant emergent vegetation of the brackish and salt marshes provide both food and cover. Recently, they have expanded their winter range to interior agricultural lands in states such as Arkansas, Mississippi, Louisiana and Texas, where corn, rice and pasture grasses provide abundant food supplies. Greater snow geese breed primarily around Foxe Basin, northern Baffin, Bylot, Axel Heiberg and the Ellesmere Islands located in Nunavut, Canada and in Greenland. They prefer to nest in colonies on well-drained westward slopes or vegetated hilltops, and females lay an average of 4 eggs. 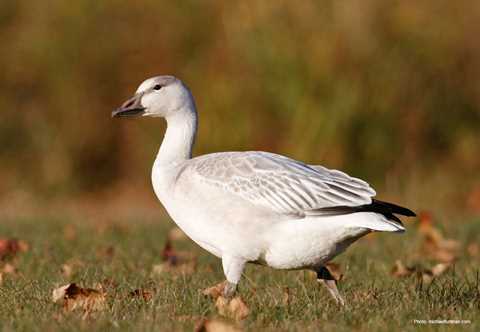 Average length: M 31", F 30"
The greater snow goose is a slightly larger version of the white-phase lesser snow goose. No color dimorphism has been discovered in this race. In the field it is virtually impossible to tell these two apart. In the hand, the larger size and longer bill of the greater snow goose distinguish it from its smaller counterpart. The sexes are similar in appearance, but the female is often smaller. Greater snow geese are grubbers, feeding on roots, rhizomes and shoots of bulrushes and salt-marsh cordgrass. They also make extensive use of agricultural fields found adjacent to wintering areas. Greater Snow Geese breed in the high artic islands and winter on the mid-Atlantic Coast. Their distribution is much more specific than that of the Lesser Snow Goose. 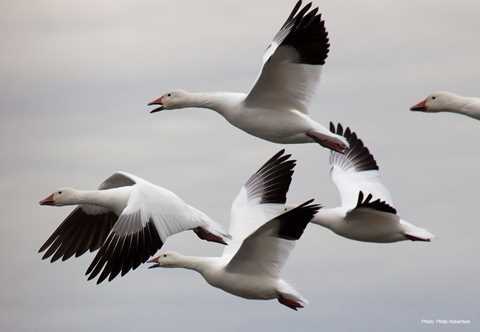 Greater snow geese leave their arctic breeding grounds and migrate along a narrow corridor through eastern Canada and the northeastern United States to the mid-Atlantic coast (from New Jersey to North Carolina).